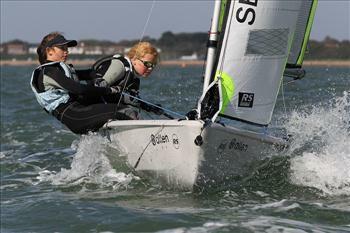 Perfect condition, sunny with 8 – 12 knots greeted the 50 boats taking part in the first Grand Prix Circuit event of the new season at Lee On Solent SC. 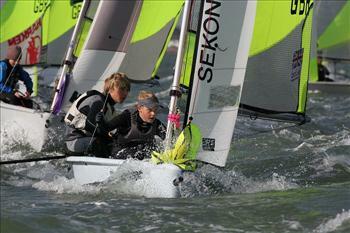 The event was also the first squad selector for many of the RYA & Class Squads being run this winter. The majority of fleet were over at 30 seconds to go so a General Recall flag was raised & a black flag put in place. Six boats were caught on the next starboard biased start. When the fleet got away there was perfect hiking conditions & it was Tom Darling & Will Dolin leading at the windward mark. Jamie Smith & Piers Nicholls were hot on their heels & took the lead on the final downwind leg as the course was shortened. In 3rd was Anna ( stepping in for a poorly Sam ) & Katie Prescott. Three boats were caught black flag on the port biased start for the second race & leading at leeward gate was Flynn Davies & new crew Henry Jameson; 2nd Max Matthews & Guy Rivington with Tom & Will in the 3rd. Max & Guy took the lead on the second beat which they held to the finish with Robbie & Alex King gaining to take 2nd & 3rd Tom & Will. By race three the sea breeze had picked up to 14 knots. The warning signal for race 3 went up then down as the race was postponed whilst the wind settled. Again it was Tom & Will ahead at the windward mark ahead of father & son team Daniel & Martyn Lewis. Jamie & Piers reveled in the conditions to lead at the first windward mark with Flynn & Henry in 2nd & newcomer to the class Clark Rutter & Matt Thornton in 3rd. After lots of place changing due to shifts, wind speed variations across the course & strong tide meant that there was lots to play for. As the wind shifted so the 2nd race was postponed whilst the pin mark was re laid. The fleet eventually got away after numerous postponements due to the tide carrying the fleet over the line. A big left shift caused another postponement whilst the course was re set for the final race. Three boats were caught black flag on the general recall. The fleet finally got away in 15 knots & three more boats caught black flag. By the 2nd windward mark Elliott Wells & Jake Todd had the lead from Max & Guy with Sophie & Izzy still in 3rd. The win went to Elliott & Jake but the 2nd place for Max & Guy was enough to win the Bolle Feva Grand Prix by two points from Jamie Smith & Piers Nicholls . Robbie & Alex King were one point behind in 3rd.